Dimensions (HxWxD): 1" x 0.85" x 0.75"
These trios are made up of one each small, medium and large Green Fluorite Octahedrons. They are an average of .75 of an inch to 1 inch in diameter for the largest of the group and .75 x .75 x .65 inches for the smallest. The average weight of the Trio is 43 grams for the set. So you get 3 of these beauties for $10! Some as you can see have a vein of purple fluorite running through them. They are the perfect size for use in meditation, or to place on a person's body during energy healing sessions, and fit easily in your favorite pouch or medicine bag. Fluorite, or Calcium Fluoride, is a relatively soft, translucent, richly colored mineral, which is highly fluorescent, with a strong blue-violet color under a black light. Fluorite often occurs in glassy bands found in a variety of mineral environments. Fluorite is commonly found in metallic hydrothermal deposits associated with lead, silver, galena, sphalerite, or cobalt deposits. Fluorite is often found in hydro-thermal deposits such as areas with hot springs, where porous limestone has been infused with aqueous fluoride. 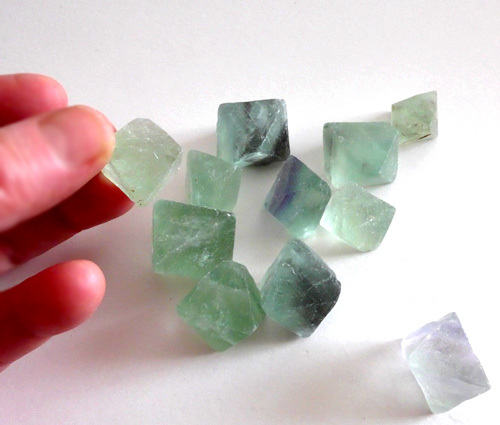 Fluorite grows naturally into readily identifiable octahedal crystals with well defined edges and faces. Octahedrons can be visualized as two pyramids joined at the base. Natural crystals of diamond, fluorite and alum are all octahedral in shape. In sacred geometry, the octahedron represents the element of air, and is associated with the heart chakra. There are eight moon phases per lunar month. The maple flower, the jellyfish and certain oceanic sponges display an eight-fold symmetry. In Buddhism, the Eight-fold Path is the path to Enlightenment. In the I Ching of Chinese Taoism, there are eight trigrams that interact to create a model of the Universe. In many spiritual traditions, eight is the number of the Great Goddess actively birthing the material Universe. In the Hindu Sri Yantra, a sacred mandala depicting the Goddess Laxmi, there is an eight petaled lotus, which signifies the act of creation. In some Native American traditions the Goddess as Creatrix is depicted as a Spider weaving the web of life, and she has eight legs. Fluorite is said by crystal healers to enhance our powers of discernment, and help us reach a balance in relationships. All colors of fluorite are effective for clearing the aura and energy centers and can facilitate a deep state of meditation. Blue and Purple Fluorite are most effective for activating the upper chakras -- the throat, third eye and crown. Blue or turquoise fluorite soothes and energizes the throat chakra, and purple or lavender fluorite activates the crown chakra. Note: Above weight is shipping weight. Each set of fluorite octahedrons is carefully selected for you and we only choose the ones we'd like to have ourselves.